Tiba here to tell you about my favorite new show, the Cheetah Cub Cam at the National Zoo website. One of the best times to watch is about 7:00 to 8:00 am (Eastern Time - USA), although sometimes in the afternoon is good too. But hey, if the Cheetahs are asleep, or not in the video room there is always the Naked Mole Rat Cam. Vicki says there are lots of other ones I should see sometime, but so far these are my favorites. I spent about half an hour Friday afternoon watching the Cheetah cubs race around like kittens. Tashi says they are kittens, but how can they be? They're bigger than me?! Hello, Socks here. The Ashton Cats got together and celebrated the first birthday of their good friends across the sea. Vicki opened a special can of cat food in their honor and we even had a candle! Vicki didn't light it. Tiba was rather sad about that, but we all tried to explain to her that since Bob and Lizzy weren't here to blow it out, it didn't make sense to light it. (Not to mention six cats, canned cat food, and a lit candle does kinda sound like a recipe for disaster). My daughter Riker was, of course, very happy to eat her share. 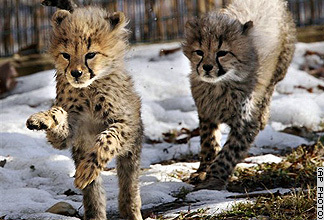 Hi, Tashi here again, with happy news about cheetahs. 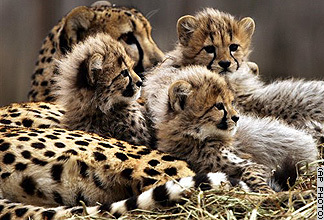 The National Zoo's Cheetahs had kittens several weeks ago, and they are out and about now. Here are a couple pictures, but if you want to read about it, or see more pictures scritch here.